Here is the story of two teaching institutions - New Zealand Assembly Bible School and GLO Training Centre - serving the Christian Brethren churches in New Zealand. These institutions would eventually combine to form Pathways College of Bible & Mission. Each of the two original schools encountered major difficulties in their early stages, but survived to bless not only their students, but also the wider Brethren movement. This book tells the story of people, many with a deep Christian commitment, and it tells an inspiring story of the ways of God. Presented in hard cover, coffee table format, the text is illustrated with over 120 black and white and colour photographs. "This story is instructive, satisfying, relevant. David Burt avoids the clutches of the institutional. He writes about people: of inspiring vision and personal sacrifice. Of beliefs and action. Of deep commitment to biblical literacy and faithful service. It challenges a new generation." "Heart-warming, insightful and moving, this story of the journey so far is well worth the read. It will inspire and encourage you." "An encouraging and moving account of lives impacted or radically changed by the work of the Holy Spirit, as students studied His inspired record of a living Lord and Saviour. 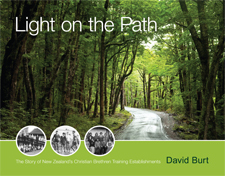 A book not only for past students and their families, but all who have an interest in the history of the Christian Brethren movement in New Zealand."